There comes a time in a person’s life when they see something so beautiful that it brings tears to their eyes. Space ships, laser rifles, power backpacks,France being destroyed and of course, the mighty lizardman with a mohawk. People will cry my friend, people will cry for hours. To be very fair to the man. At least he’s spelt colonisation the correct british way. Unless it was changed for a British release. That’s one of the most unconvincing lizardmen i’ve ever seen. There’s just something about it that looks really fake, (not that i’m an expert on what a lizardman should look like). The neck is freaky and the mohawk is just stupid looking. I love the way the title has a glowing halo thing going out in an explosive fashion and, if this wan’t enough, a horizontal glow bit going across Aftershocks. Kaapow! Wow, can’t you just feel the world shuddering with the force of this book. And he’s got such a big laser gun and there’s the Eiffel Tower, and…wow..just everything! One thing we can be certain of, in this otherwise horribly uncertain world: intelligent lizard men would go into war naked. Especially if the war were in the chilly northern hemisphere. The more I look at it the more it drags me in. It’s like every action movie poster ever created, but with a lizard. Oh and his tongue is clearly trying to taste his microphone headset. Bad lizard! Bad! That has to be the campest Lizard man I’ve ever seen grace a book cover. microphone headset! That was really bothering me, i seriously couldn’t work out what it was. I actually thought it was something stuck to the cover haha. These are thoughts that certainly crossed my mind whenever I watch it. I note that the Eiffel Tower no longer appears to be located in Paris, but on a flat plain somewhere with no surrounding buildings to spoil the view. Either they moved it (perhaps by launching it into orbit a-la _The Reproductive System_, then landing it again, without bending a single girder), or they levelled Paris but carefully left the tower alone for the sake of this shot. Considerate of them. Oh, and I must protest. We asked for more half-naked women and you gave us a naked lizard. But maybe the lizard is female. It’s hard to tell with lizards. It’s impressive that this lizard is both active enough to engage in combat with mammals and has what appears to be fully functioning binocular vision: unusual in lizards. Perhaps this is a not a lizard but a dinosaur? ‘Cos we all know the dinosaurs had laser guns: one small temporal portal — that’s the glowy thing at the bottom of the picture — and they’d be all over Paris like there’s no tomorrow. Still not accurate, though: if it’s a dinosaur, it should be feathered. Well maybe that’s why he’s blowing everything up! Making fire on a large scale to keep himself warm! It really does look like something a student in a college multimedia course would create. Blowing everything up is a good way to get temporary warmth. Can’t imagine the Eiffel Tower providing much kindling though. Plenty of the stuff in the Louvre though! Most of of the Colonization novels had terrible covers, the last reprint was much better. Check out the Guns of the South by the same author great book another naff cover. Haha just checked that out. Nice to see a nice southern gentleman holding an AK-47! How does Adam know that the lizard man is naked? This is just his febrile imagination at work. As far as I can tell he’s wearing some kind of brightly luminescent underpants. Today, Patty and Selma, tomorrow: the world! 1.The spine on most lizards comes in at the back of the skull, rather than (as in the human) on the underside. The artist chose to simply turn the head at right angles rather than expand the skull, or do something else creative. 2. The headset ear piece is practically on the creature’s mouth. Whereas in real lizards, the ear is higher up, posterior to the eye. 3. On most reptiles, the nasal bones don’t extend so nearly far up the skull. Putting sunglasses there looks…awkward. 4. See also, 1. Human necks are somewhat S-shaped in lateral view. This neck is just straight. It should be either curved or arcuate, as in other primates. 5. Because of the lizard’s sprawling posture, there’s less separation between the arm muscles and the body wall muscles. The artist seems to be having it both ways by emphasizing the enlarged rotator cuff and the slimmer muscles on the upper arm. Sadly, this makes it look like creature has rolled up its dermal sleeves. 7. See also 6. The metacarpals on the hand are far, far too angular. It’s as if MCIV and MCV merged together at the base or some such. No hand that I know of in the animal kingdom looks like this. 8. See also 5 through 7. The left arm looks completely different from the right; the left arm is so much more anthropoid. 9. See also 8. The left wrist is almost entirely absent. From the way his left arm is portrayed, the creature’s palm extends right through to his forearm! 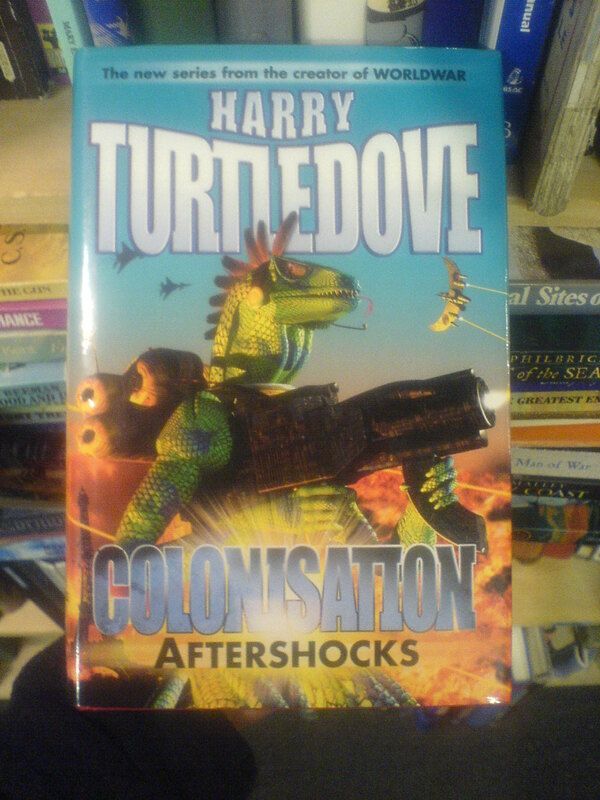 I first read this title as “Colonoscopy Aftershocks” which I really think would be more interesting. And why would you need a banana clip on a laser weapon? The weapon is incredibly bulky in comparison to it’s length. The war iguanas grip looks incredibly awkward. Taking into account the weapon design and the firing posture it is basically impossible to actually sight along the weapon. Area and/or suppressing fire serves a useful purpose, true enough, but most weapons aee designed so that the user, if necessary can effectively engage individual targets. So we have a biologically and technologically inappropriate soldier who has to blow up everything simply as a survival strategy. I wonder if that’s a plot point? It’s clearly the half-size Eiffel Tower replica in Las Vegas. Note the red desert-y background. In spring, summer, and fall, of course the lizards can go naked. They’d have quite the advantage over humans in midsummer. Even the winters are mild during the day.